While millions are spent on research, litigation and regulations on the 'chance' cellphone use 'may' cause caner... millions of people are injured annually and die everyday from the pure inattentiveness caused by cellphone use. We all see it, we all know it, yet most of us do and allow our loved ones to. Using a cell phone while walking is so distracting that people are likely to miss a clown riding a unicycle. Spotting a clown - an experiment run by Western Washington University this past fall. There was a student who knew how to ride a unicycle and a professor who had a clown suit. 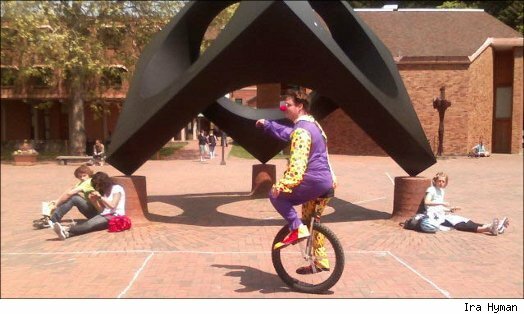 They dressed a student up as a clown and had him ride his unicycle around a popular campus square. Then they asked people, 'Did you see the Unicycling Clown?' 71% of the people walking in pairs said that they had. 51% of the people walking alone said that they had. But only 25% of the people talking on a cellphone said that they saw the unicycling clown. On the other hand, when asked 'Did you see anything unusual?' only about one person in three mentioned a unicycling clown." "If [cell-phone use] disrupts something as simple as walking, which I'm assuming most of these people have been doing a long time and are pretty proficient at generally, we know it's going to be a really difficult task driving," Hyman said. Past research has suggested cell-phone use while driving can be as dangerous as drunk driving. But participants typically had specified conversations while operating a driving simulator in a lab setting, where other non-realistic factors might affect results. Haase - Do we really need one more study to tell us we need to minimize use?